If you need to find out who your legislators are, click the button above and provide the data required. 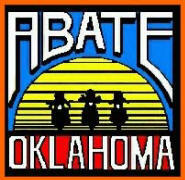 Welcome to the ABATE of Oklahoma website! safety and awareness through education and legislation to make Oklahoma the best place to ride! If you are an ABATE of Oklahoma member, ensure you log-in to the website with your username/password PRIOR to registering for any event. If you aren't logged in, your credit card may be charged an extra fee for processing, as a non-member. (these fees are out of ABATE of Oklahoma's control!). Also, you will not have full access to all pages or documents as some are only available to members who are signed-in. Our next State Board Meeting is scheduled for noon on Saturday, April 13, 2019 at Forman Harley-Davidson Roadhouse, Stillwater. Don't forget that we will also be serving a free "Biker Breakfast" beginning at 9:30AM until noon. to motorcyclists in the state of Oklahoma. From there, you can click the link to the actual bill (or laws that have been enacted) to read the full document. We will be reviewing the bills as changes are made to the status of each and make adjustments for each as they are necessary. The Specialty License Plate application for our ABATE of OKLAHOMA tags is ready for you to download & print! Turn in your application with $39.00 to your chapter, so that they will turn it in at a Members State Board Meeting. Or you can turn it in Kim Mobley at the Members State Board Meeting, you can also mail your application with $39.00 to her. Just contact her for the address so that she will know to be watching out for your application. All money will be deposited in the ABATE of Oklahoma savings account to hold for when we have the minimum required 100 applications. Once we have the minimum required 100 applications, Kim will get with the ABATE of Oklahoma State Treasurer and go down to the tax office on Lincoln Ave, Oklahoma City to process all applications at the same time. Payment will be cash, check or Money Order. All checks and money orders must be made out to ABATE of Oklahoma. A receipt of payment will be sent to you once payment is received by the ABATE of Oklahoma State Treasure. Do not send your application to OTC (Oklahoma Tax Commission), or make your check out to them. If you do write a check or money order to OTC, your check would be on hold until the applications are turned in to OTC no later than April 30th. The reason for this is so that ABATE of Oklahoma can keep track of all applications to make sure that we reach our minimum goal of 100 tags. If by any chance we do not reach our goal by April 29, 2019 of 100 tags, your money will be refunded to you for the applications that have been received. The Motorcycle Riders Foundation (MRF), incorporated in 1987, is a membership-based national motorcyclist' rights organization headquartered in Washington, D.C. The MRF monitors and when necessary, sways federal legislation and regulatory action that pertains to street riders. The MRF concerns itself with what is going on in area of motorcycling safety education, training, licensing and public awareness. The MRF provides members and state motorcyclist' rights organizations with direction and information to protect motorcyclists' rights and motorcycling. The MRF sponsors annual regional and national educational seminars for motorcyclists' rights activists and publishes a bi-monthly newsletter - The MRF Reports. "To promote awareness and education in the motorcycle community to improve rider safety. To Educate non-riders globally in he interest of all riders' safety. Let's attempt to get more members of ABATE of OK to join the MRF and get our voices heard, not just here at home, but in Washington D.C. as well! Do you feel you have experienced Motorcycling Profiling in Oklahoma? We have a complain form that we ask you to fill out and send it to us so that we can better help support you on this matter. Click on the link below and select "Open" the file. Print and fill out the form, then mail it to the address at the bottom of the form.